Jay-Z and Queen Bey- violating the US trade embargo? Recently, artists Jay-Z and Beyonce were mobbed by excited fans as they celebrated their 5th wedding anniversary in Havana, Cuba. 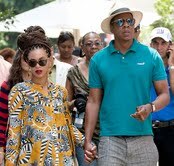 Many fans went crazy as the Carters stroll through the Cuban capital. But during this supposedly fun vacation for this couple, two Republican members of the US Congress questioned their licenses to visit this communist-led island. Congress members, Ileana Ros-Lehtinen and Mario Diaz-Balart, both Republicans from Florida, have asked the US treasury department to confirm the power-couples’ clearance to make the visit. The controversy stems from the ongoing US trade embargo against Cubam which prevents American citizens from traveling to the Caribbean country without a special license that is given by the US government. Because of this conflict, many politicians spent days wondering whether or not the US government approved of this “educational” trip. A few days after, they found out that the Treasury Department did, in fact, give the couple full approval to visit Cuba. Are politicians satisfied with this answer to their question? Of course not. In a recent interview with CNN, Congresswoman Ileana Ros-Lehtinen, who was one of the people that had a big problem with this matter, expressed her feelings by slamming the Obama Administration. Lehtinen stated, “If the tourist activities undertaken by Beyoncé and Jay-Z in Cuba are classified as an educational exchange trip, then it is clear that the Obama Administration is not serious about denying the Castro regime an economic lifeline that US tourism will extend to it. That was a wedding anniversary vacation that was not even disguised as a cultural program. As more human rights activists engage in hunger strikes, I don’t think they will see any evidence of how this scam endeavor will help them become independent of the regime”. The US embargo has been in place for more than fifty years now. This issue that caused the embargo to be put in place is no longer relevant. Since Jay-Z and Beyonce’s itinerary was open to the public and all their activities were for “historical purposes,” the government should not make a big deal out of this situation. The couple did no harm during their vacation.